Traffic control encompasses a great many things. Quality traffic control is about the details. The unique situations within the application of work zone setups require specific care and attention. As an industry leader, Flagger Force has the experience and knowledge to apply the right traffic control solution to your jobsite. 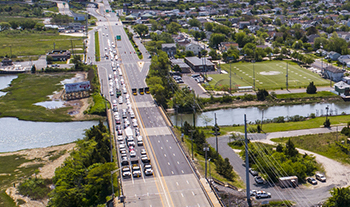 With over 1,600 employees in the Mid-Atlantic area (including PA, DE, MD, and VA) and average yearly growth over 20%, we offer the size and scope to handle any traffic control situation. 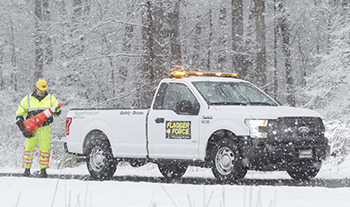 We’ve spent years developing our Flagger Force Academy to train our employees in safe, high quality traffic control services. We can quickly and effectively respond to your temporary traffic control service needs, expectations and project requirements. 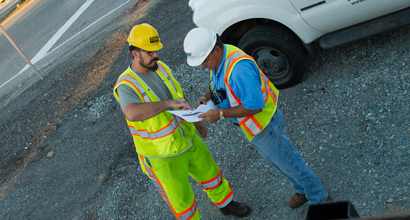 No two traffic control projects are alike, which is why we take the time to discuss your project with you, visit your site to better understand the situation. We will put together a qualified team for your job that includes crew members, crew leaders, advanced crew leaders supported by teams of field specialists, safety professionals, and quality specialists across our operational footprint. Standard operations typically involve alternating traffic flows through a single lane of traffic. These mostly occur on high-speed highways and often involve stopping traffic in both directions to allow construction crews to pull cables or wires across the road. 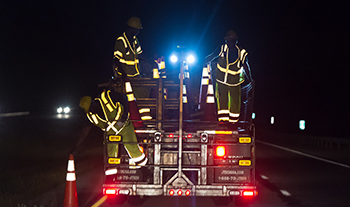 Advanced workzones require additional coordination and planning, such as closing multiple lanes, deviating traffic into the oncoming lanes of a highway or controlling traffic around a manhole or dig on a busy street or intersection. We have the experience, density, and training to rapidly provide a storm response for our utility partners and transportation contractors. View all of the steps needed to set up an account with us and start placing orders for professional traffic control services. Here are some of the FAQs asked by people like you. 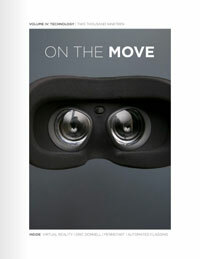 Learn more about our capabilities and processes here. Standard Flagging Operations: Standard flagging operations typically involve alternating traffic flows through a single lane of traffic. We train our flaggers to pay close attention to both the volume and speed of traffic so they can coordinate and adjust to the needs of construction crews and their equipment for a seamless, safe flow of traffic. Our best practices are based on the state standards to position flaggers at each end of a lane restriction, so each flagman can focus on the vehicles they’re facing. 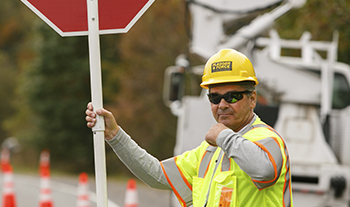 Standard verbal and non-verbal communication allow flagmen to anticipate flow changes and allow construction crews access to their work zone while minimizing traffic delays. Rolling Stop or Slowdown Operations: Unlike most standard flagging operations, rolling slowdown operations often occur on high-speed roadways. They often involve interrupting traffic in both directions to allow construction crews to perform activities such as pulling cables or wires across the roadway. 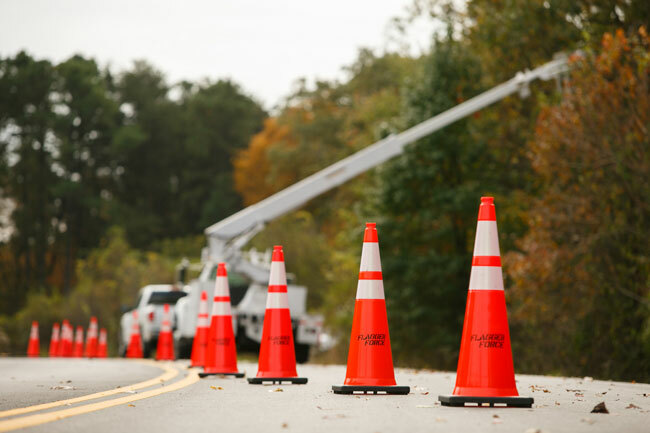 We provide our crews the right tools and key safety equipment — such as truck mounted attenuators. Field teams work together to safely stop traffic while allowing construction crews to finish their work and then release traffic to its normal flow as soon as safely possible. Advanced Operations and Setups: Advanced traffic control services often include several advanced or complicated aspects that require additional coordination and planning, such as closing multiple lanes, diverting traffic on high speed roadways or controlling traffic around workers in a busy city street or intersection. Our flagmen anticipate traffic and construction crew movements and provide clear guidance to people passing through the jobsite. We have developed best practices for each type of complex jobsite and train our employees through our Flagger Force Academy, our dedicated safety training program. Emergency Response Teams: Not all temporary traffic control situations are planned, which is why we offer service 24/7/365. 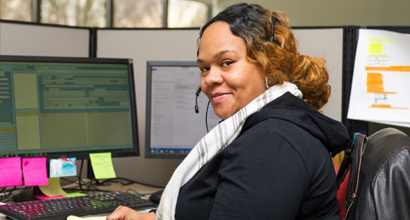 At any moment, you can contact our friendly and helpful team, and we will work with you to find a quick, safe and satisfactory traffic control solution. We can send a single crew or multiple crews to respond to incidents ranging from a water main break to a massive weather event. When a roadway emergency occurs, let Flagger Force handle the traffic control because we have the capacity and density required for a variety emergency jobs. Contact Flagger Force today for more information on the temporary traffic control services we can provide.